3. What would your initial management be? 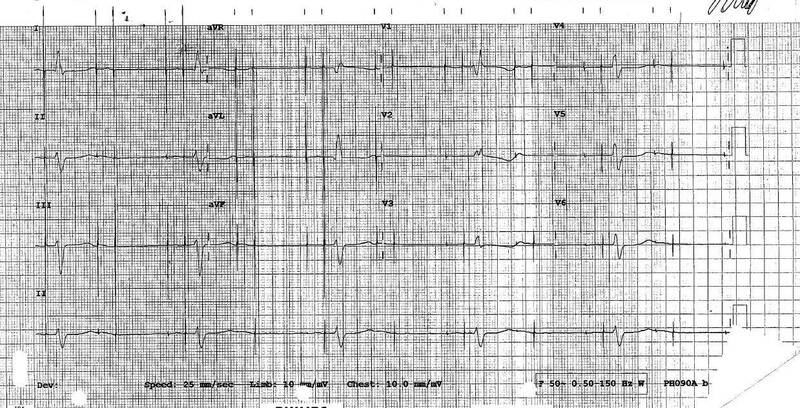 This ECG demonstrates pacing spikes from a dual chamber pacemaker and failure to capture with a ventricular escape rhythm. There are no captured beats. 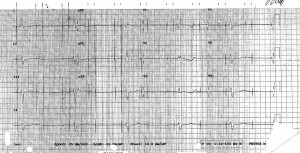 A captured beat will have the QRS complex occur right after the preceding spike. If you look at the gap between the spikes and the QRS complexes, there is far too long to wait for the QRS. In terms of Management the main initial Question is is the rhythm perfusing or not. ARC guidelines have adrenaline 1st line as a chemical pacing agent and isoprenaline as second line. All these drugs will do is turn up the escape rate and possibly help with some inotropy, but if the escape is non perfusing, making it faster won’t be a very successful strategy. Some hospital’s cardiology unit seems to prefer isoprenaline, I am unable to find evidence to support this , but it may be purely practical, as CCU are not able to run Adrenaline infusions, but can do iso.